The three groups of ancient Anasazi ruins in Navajo National Monument are large, intricate and well preserved, yet the site is not much visited or publicized, partly due to its remote location, but more so because of the restrictions placed on access. The pueblos were built between 1250 and 1300 in deep sandstone canyons cutting into the Shonto Plateau of north Arizona, in the middle of the Navajo Indian Reservation, at the edge of a vast, largely inaccessible region that extends north towards Navajo Mountain and Lake Powell. One of the three ruins (Inscription House) has since 1968 been permanently closed to the public owing to its delicate state, while another (Keet Seel) is open only during the summer season (late May to mid September) via a 17 mile round trip, ranger-led hike, and even then, visitors are not allowed to enter most of the rooms. So the majority of people see only the third site, Betatakin, which is viewable from afar at the end of a short trail starting near the national monument visitor center, ten miles from US 160 on a paved road. Even here, opportunities for close-up views are limited, as again, the 1.5 mile approach trail is open daily only during summer, hiker numbers are limited, and rangers are stationed at the site to prevent anyone getting too close. Other facilities at Navajo National Monument are a picnic area, museum and two pleasant campsites (which are closed half the year), and like the other NPS unit on the Navajo Reservation, Canyon de Chelly, there is no charge either for entry or for camping, or for the guided hikes, when available. The access road for Betatakin and Keet Seel is AZ 564, forking north off US 160, 19 miles east of Kayenta and 52 miles west of Tuba City/Moenkopi; the road climbs steadily from Detrital Valley up a lightly wooded hillside for 10 miles to the edge of a plateau at 7,200 feet. 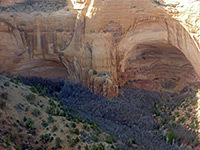 Long, branched canyons radiate out to the east, enclosed by sheer, desert varnish-stained walls of orange Navajo sandstone, a typical Colorado Plateau landscape. Once inside the national monument, the road passes Tsegi Overlook, a viewpoint of Fir, Tsegi, Dowozhiebito and Keet Seel canyons, then reaches the visitor center, museum and one of the two campgrounds (Sunset View), before ending a little further at the second campground (Canyon View) and the trailhead for the hikes to the ruins. As well as these long trails, the monument also has three short paths on the mesa top, open all year with no restrictions: the 0.4 mile Canyon View Trail links the visitor center with one of the campgrounds, giving views of the upper end of Betatakin Canyon, while the Aspen Trail (0.3 miles) descends 300 feet through aspen woodland to a pour-off at the head of the canyon. Most popular is the 0.6 mile, paved Sandal Trail, which crosses open slickrock then winds over bushy, undulating ground to a viewpoint on the south edge of the canyon, directly opposite Betatakin Ruin but 1,300 feet away, and 500 feet above. As the ruin is in shadow most of the day, situated at the foot of a high, south-facing cliff beneath a big overhang, and the surroundings are likely to be sunny, the site is difficult to photograph effectively from this distance. Notices along the path describe the common plants of this pinyon-juniper environment. There are two options for hiking to Betatakin. The shorter (1.5 mile) route starts along the Aspen Trail, then descends another 400 feet to the canyon floor, and continues to the base of the ruin. Rangers guide people on the descent and while at the site but hikers can return unescorted. Because of the slow pace of the guides, the NPS gives average times for the 3 mile round trip, including the narration at the ruin, as 3 to 4 hours. The limit for this hike is 15 people per day. The longer approach first heads east along the north rim of the canyon to a promontory at Tsegi Point, switchbacks down to the lower end of the drainage then turns back upstream. This is a 2.5 mile (one way) trip, and has a 25 person limit. Both hikes are staged once a day in summer; at other times of year just the shorter route is available, weekends only. Reservations are not necessary, though they are for the 8.5 mile hike to Keet Seel, for which the limit is 20 people per day. A primitive campground nearby accommodates overnight visitors, though the day hike, although long, is not too difficult, after the initial 700 foot descent from the rim. The third site at Inscription House is located 15.8 miles due west of Betatakin, on the north side of the lower end of Nitsin Canyon, a wide, branched tributary of Navajo Creek. The ruin was once reachable by a trail starting at Inscription House Trading Post along IR 18, a 4.5 mile hike that also passed several other cliff dwellings, but all this area is now off limits.